This is another one of those topics I receive a fair amount of emails about. Anytime fuel is involved there is an understandable reason to be nervous. 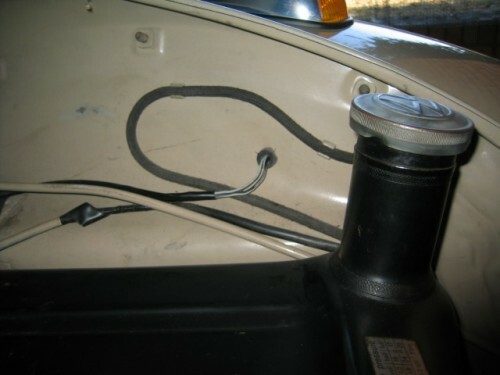 However, rest assured you can in fact replace the fuel tank in your vintage pride and joy. It all starts with a 13mm wrench and a bit of confidence. YOU CAN DO IT! Deep breaths, and take each part step-by-step. I also recommend picking up a set of plastic stack-on organizer bins. These help keep track of the small bits. Note: This task is easiest when your fuel tank is very close to empty. Step 1: Remove your trunk liner; push in on the corners and it should lift right out. Step 2: Unscrew and remove the fuel gauge cable from the sending unit. Remove the cover from the sending unit and simply remove the cable from the lever arm. Keep the sending unit installed as this will help to contain the fuel in your existing old tank. 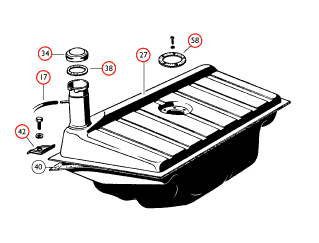 Step 3: Loosen and remove the four bolts and clamps located at each corner of the fuel tank. A 13mm socket will do the trick. Step 4: Lift the fuel tank slightly and rotate 90-degrees. This will allow access to the fuel hose. Attach a hemostat onto the fuel hose and remove the hose from the main steel line. A pair of vice grips will work as well, but a hemostat makes you that much cooler. Sorry, but smoking is not allowed during this process. Step 5: Remove the fuel vent hose from the fuel tank filler neck. Step 6: Lift the tank from the car. Take a moment and pat yourself on the back because you’ve done a great job. To install the new tank just do this process in reverse. Don’t forget to pick up some fuel clamps and German fuel hose. Also, make sure once the old fuel tank is out that you remove the sending unit. 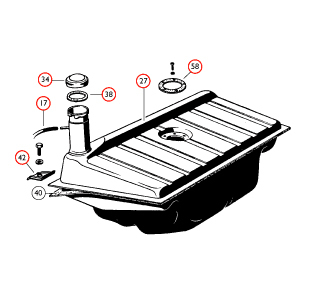 You’ll also want to install a tank outlet kit in your new fuel tank. This is very simple. Speaking of parts, let’s talk about exactly what you’ll need to get the job done the right way. This is assuming your fuel sending unit does not need to be replaced. We have all the parts you need. 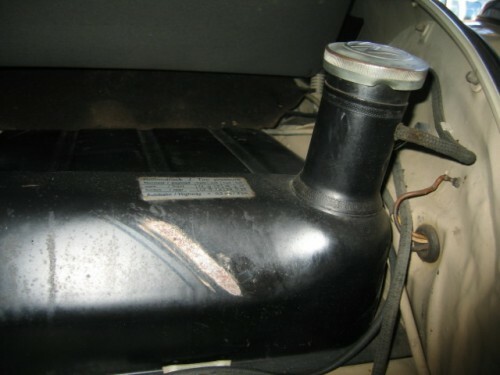 111201075C: Fuel tank. This tank is made to factory specifications with the discriminating restoration enthusiast in mind. This tanks features the design elements of the original including factory-gauge steel. Better yet, the tank is designed to allow for the use of the original size fuel cap. This is a feature that is sorely lacking on all other aftermarket fuel tanks. I hope this helps you get over the fear of removing the fuel tank. It’s a really an easy item to replace. Just take it slow and remember not to smoke, BBQ, or strike any matches during the process. If you’re interested, I’ve also documented how to properly move that fuel filter out of your engine area. Thanks so much! Yep, super easy job. For the most part, these cars are like playing with legos. I just signed you up for the ’67 email site alerts. You’ll see that email in a moment. Oh No! That poor Beetle burned to the ground on the Bay Bridge! The way we love our VW’s,someone must be heartbroken. Hey thanks man…..I appreciate the info on tank removal (specifically my newly acquired 67)!! I have enjoyed your site very much and hope that you have the time and inclination to keep adding! Bugging in Birmingham AL!!!! Thanks for reading! Let me know if I can ever be of help. im trying to find the correct fuel tank vent routing. do you have any photos or routing diagram? is the end of the hose open or does it go to something? Do you mean through the tunnel of the car? or, where the tank sits in the front? I’ve CC-ed Jay as well. Give us a bit more info on your project. Here are images of the area in which you are speaking of. That is the hose I was talking about. I routed it through the hole just below the vent, I just wasnt sure if the end was open or connected to something. thanks for the help from you guys. Great site guys! Thanks! That’s what we are here for.. The hose mentioned in the afore photo from Eric… can I ask…is this hose lose then?? (as mine is currently and I cannot figure out where it goes).